A brave Viking can’t set sail without all his brothers on board. In this challenge you need to be a keen observer, use crafty strategies and try not to be fooled by those thick Viking beards. Quickly run through your cards and choose your crew. 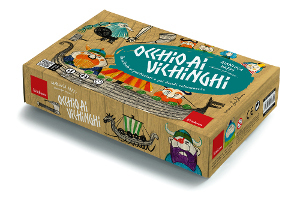 Watch out for the Vikings is part of the Playing to grow series, a new line of board games, conceived by Gianluca Daffi, expert in childhood and adolescent psychology and university lecturer. Each game focuses on a specific executive function or cognitive process with the aim of developing it whilst having fun. Watch out for the Vikings develops attention, working memory and planning. You can’t make more than three sets of triplets at a time. If players find a set of twins or triplets but have no free space left on the bridge, they have to leave them in the pack. Once the Vikings have boarded they cannot come down off the bridge, unless the families have not been put together properly. o	when the game leader shouts «STOP!». The player who manages to form three sets of Viking triplets shouts out «ALL ENLISTED!» and the game stops: if the families are correct, the player wins the game! If the sets of triplets are not correct, the player is eliminated and the round ends. The eliminated player’s cards, including those on the bridge are picked up, shuffled and re-dealt amongst all the other players and the game continues until a winner is declared. If the two players’ cards have different actions, they have to do the action not shown on the cards: clap their hands above their head. Executive functions are the set of mental processes which monitor our thoughts and behaviours. They incorporate various neurological operations which are needed to control and coordinate our actions. Put more plainly they are like a series of little gnomes who all work together in our brain, helping us execute any kind of task we might face in our daily lives.